At least month’s 4th International Biocuration Conference in Tokyo, held by the International Society for Biocuration, Raja Mazumder gave a nice talk about “Community Annotation in Biology” – that is, getting biologists outside of bioinformatics to provide their expertise to efforts to distill the maximum possible value from the wealth of biological data we’re producing these days. By way of setting up his talk, he spoke about Margaret Oakley Dayhoff and her role in calling for community assistance in the early days of protein bioinformatics. However, the part that really stuck in my head was something else entirely about Dayhoff’s work – something near and dear to my heart. That something is the one-letter amino acid code. So how do we talk about protein parts? A protein is made of a series of amino acids linked together in a continuous chain (and then folded up into a three-dimensional structure, but that’s a topic for another day). If you’re not used to looking at this way of representing a chemical structure, you can learn more here. The short-and-sweet version is that this is a drawing of what the amino acid lysine actually looks like, as a three-dimensional object. 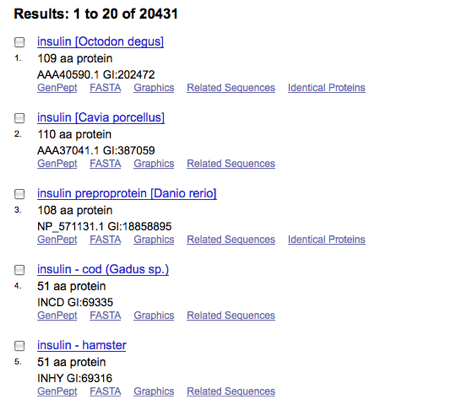 Human insulin is built from 110 amino acids in a row. You might imagine that it would be essentially impossible to talk or think about these proteins if you had to do it by drawing over a hundred of those pictures in a row. It would be like having to give directions by drawing a picture of every house that you pass on the way from point A to point B. So we don’t do that. Even more technically, that should be written methionyl-alanyl-lysinyl…, but either way, it’s super inconvenient, and makes for some very large words. This is the abbreviation system that was in place during the early days of bioinformatics. Dayhoff, however, saw that it was not going to work, and suggested an alternative. This is where the vision part comes in. Dayhoff was one of the early movers involved in collecting protein sequence data, well before we had easy access to computers, or, say, the Internet. In other words, she wrote letters to folks and asked them to send her the sequence information, so it could be published in book form for the edification of interested parties. But she saw that the rate of acquisition of sequence data was increasing, and she also had the vision to realize that it would pick up tremendously in the future. In his talk, Raja focused on the increasing need Dayhoff saw for community assistance as the pace of sequence acquisition increased. This is a big need even today, since expertise is scattered across a huge number of researchers, but only a small percentage work directly on actually collecting and evaluating sequence data. You see, there are a few sets of amino acids that share a given first letter, so we have to be a little creative when coming up with a single-letter code. You can find the full code here. This is us comparing the sequence of the (predicted) insulin from a rodent called the Degu with the insulin from Chimpanzees. The score and other stuff come from using a computational method known as BLAST to compare sequences, treating them as, effectively, lines of code to be compared. In fact, many of the tools we use to work with protein sequence data were derived from computational methods originally designed for the analysis of human languages. 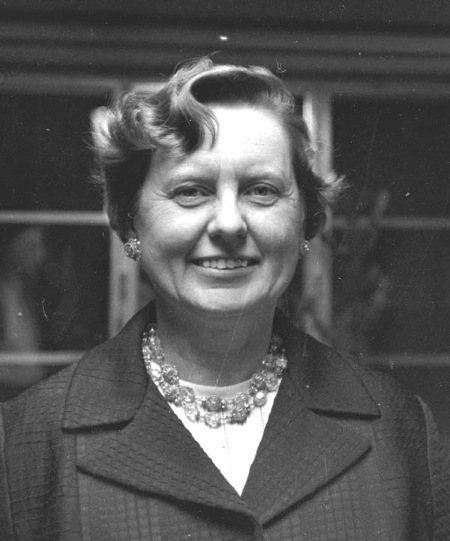 Margaret Oakley Dayhoff may not have imagined the specifics of how we work with protein sequence data, or the phenomenal amount of data we’d have just a decade after the turn of the millennium. What she saw, however, was that if we were going to work with a library of protein sequence data, we really needed to treat the protein sequences like words. (Read more about Dr. Dayhoff here and learn more about the award honoring her memory here).